Its an early start today with just myself and Neil fishing, Dean has Cricket nets starting today so cannot fish. We are loaded on a very icy slipway at just after 6am and with the nav lights on set off for the One hour run into the city. We want to be fishing with as low light conditions as possible so its still quite dark as we head off. The area we have decided to fish is much further into the city and takes about Thirty minutes longer to get there. We also need to get there early to get our mooring spot on the far bank before any other anglers set up on the bank itself. In no time at all its getting light, around 6.25am but the temperature feels much colder than the minus One on the way to the boat. Full winter gear and silly hats are out in force today, but as ive often been told, there are only Two types of wally. Cold Wally's and warm Wally's ! We arrive at our chosen spot and its free of any other anglers so we tie up and get sorted. What happens next is fairly remarkable, as you read on, you will see why. We are going to fish Two rods each, One with dead baits and the other a live bait, rotating them round as we go on, ie. Deads close in, lives out in channel, then switch them about until we find some fish. Our first casts are made at exactly 7:15am and after just Fifteen minutes my live Roach is taken. A lively 7lb fish is boated and released straight away. We never weigh any fish now that we think is under our own Pbs, we just estimate them. Im re baited and back, but no sooner ive put my rod into the rest, Neil is into a fish too, this one on a float ledgered Smelt. This is a better fish and as Neils PB is 13lbs we have to weigh it. It goes 13lbs EXACTLY !!! A quick photo and its back in, my live bait is off again, within Five mins. This fish feels slightly better than my earlier 7lb, but comes off before we get a sight of it. 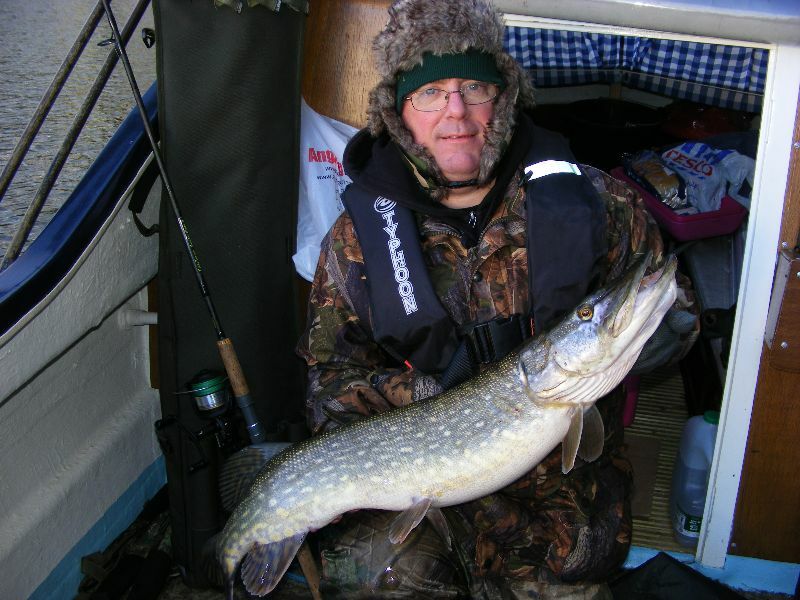 Neil is in again (9.10am) this fish again on a dead bait Smelt out in the main channel. This fish stays deep and just plods, normally a good sign. slowly but surely its played to the side of the boat and its a decent looking fish. As Neil draws it over the net it goes berserk and the water is turned to foam. I scoop it up and as i reach for the net rim to lift it in, the hooks ping out ! 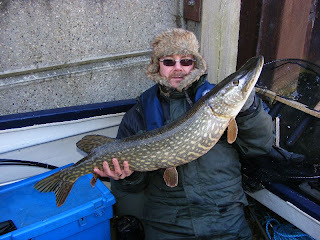 Result, a self unhooking Pike ready to be weighed. This fish goes 15lbs exactly, a new PB for Neil. No sooner the fish is photographed and slipped back, (9.20am) My dead Smelt is away. I tighten up but it drops the bait instantly. Not to worry Neil has just re cast his Smelt back into the channel and its taken instantly (9.25am) An 8lb fish is boated, unhooked and released. A "nuisance", not really, 4lb jack is unhooked in the water. The sport is so hectic there is not really any time to take photos let alone brew a hot drink. We then have to wait all of Twenty whole minutes for the next take,(10.15am) just as ive put the kettle on (Coffee trick always works) Neils live Perch is away and again this fish feels bigger and stays deep in mid river. Slowly its coaxed in to the net, again this fish looks a decent double. After unhooking and a quick photo this fish is recorded at 15lb 8oz, another new PB for Neil. After weighing Neils fish i make the decision to reel in my rods and make a drink and our lunch, Quarter pound cheese burgers. Within Ten minutes Neil misses another take on a live bait but then things slow down enough to have a hot drink and eat our food. Its been a hectic Three hours with hardly time to do anything except unhook fish and re bait, we are not complaining though. These days don't come often enough. We must have found a decent sized group of fish on the feed, in the right place, at the right time as they say. After our lunch and with things a bit quieter, we decide to move back into the Riverside section to finish the day off. 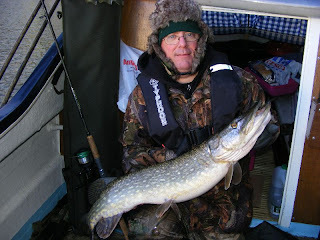 taken on a float ledgered Smelt. Its around 2pm now and the sun is actually quite bright and starting to warm us up. We decide to head back after a lovely days fishing.